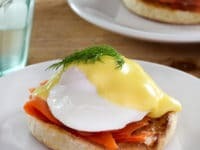 This delicious eggs Benedict recipe with smoked salmon Nova lox and hollandaise sauce is the ultimate breakfast, brunch or brinner meal. 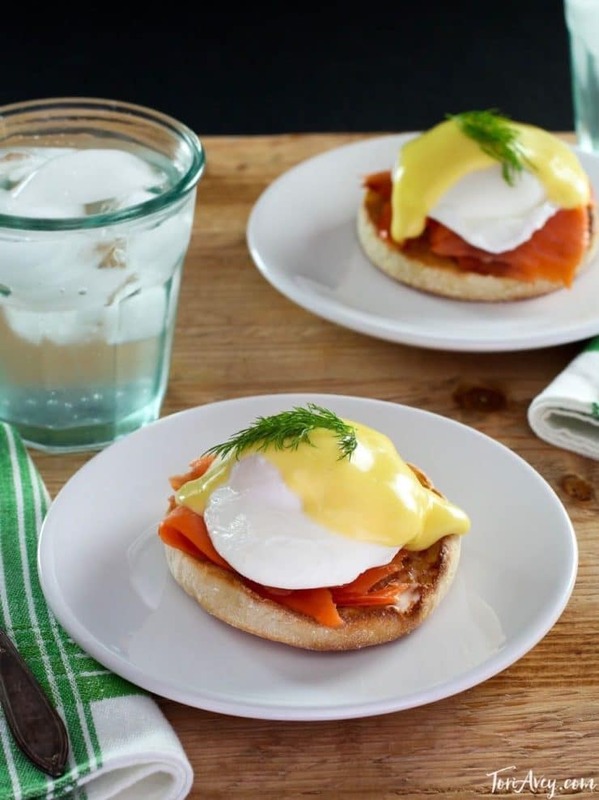 Nova lox, poached eggs and cream lemony hollandaise — count me in! This Nova lox Benedict has got to be the ultimate breakfast/brunch/brinner meal. I tried a version of this dish a few years ago at a hotel restaurant in New York, then rushed home to replicate it in my own kitchen. It’s a kosher alternative to traditional eggs benedict, and personally I like it even better than the Canadian bacon version. Quality smoked Nova lox are incredibly delicious. When layered on a toasted English muffin, topped with a poached egg and lemony hollandaise sauce, something magical happens… it’s like a flavor explosion. Nova lox are thinly sliced, smoked and salt-cured salmon fillets. Smoke-curing is one of the most ancient methods of food preservation. When smoke-curing salmon, the fish is dried and salted to remove moisture. The fish is then exposed to smoke. The smoke combined with the salt creates a unique flavor that has become synonymous with Ashkenazi Jewish cuisine. The process of smoking fish was adopted centuries ago by Eastern European Ashkenazi Jews; smoked fish was stored and eaten throughout the long, harsh winter season. Nova Lox (aka Nova Scotia salmon) are a delicious form of salt cured salmon… they are cold smoked and cured with a milder brine than most smoked salmon, giving them a smoother, lighter flavor. While Nova lox used to originate in Nova Scotia, Canada, the name has evolved to describe the flavor of the mild brining and cold smoking process– and now, you can find Nova lox sourced from a number of places. You can use any type of lox with this recipe, but I really prefer good quality Nova if you can find it. The flavor is just perfect. Once you learn those two methods, you’re good to go! The rest of the process takes only minutes. Impress your hubby with breakfast in bed. 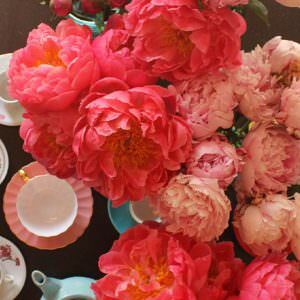 Host a wedding shower and serve it for brunch. Or have it for brinner, my personal favorite. 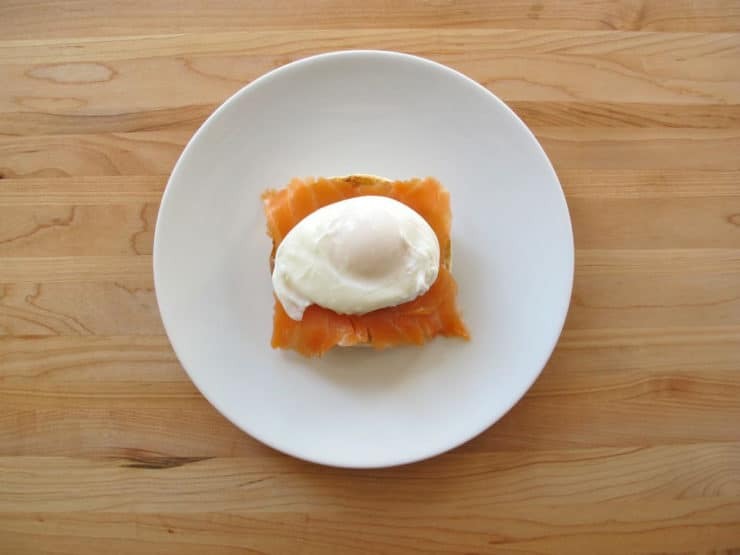 A delicious Eggs Benedict recipe with salmon lox and Hollandaise sauce. Poach 4 eggs to desired doneness. 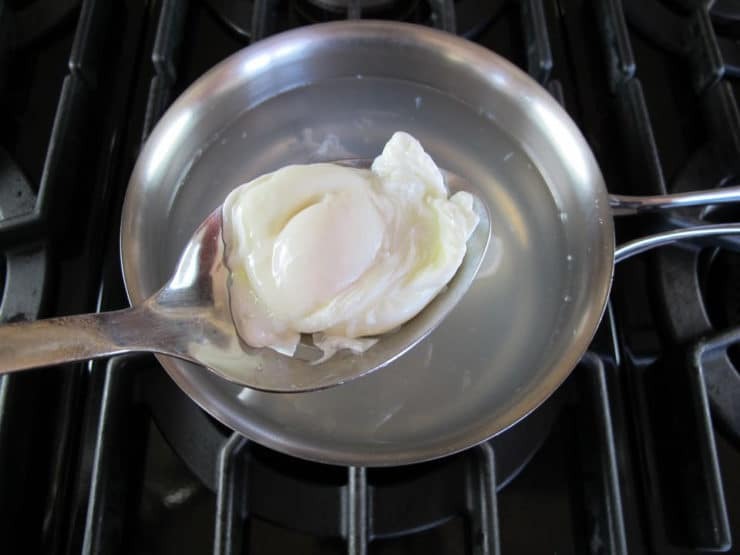 For instructions on how to poach eggs, click here. If you'd like, you can poach the eggs up to 1 hour in advance, then reheat them by placing them all in hot (not boiling) water for 1 minute prior to serving. 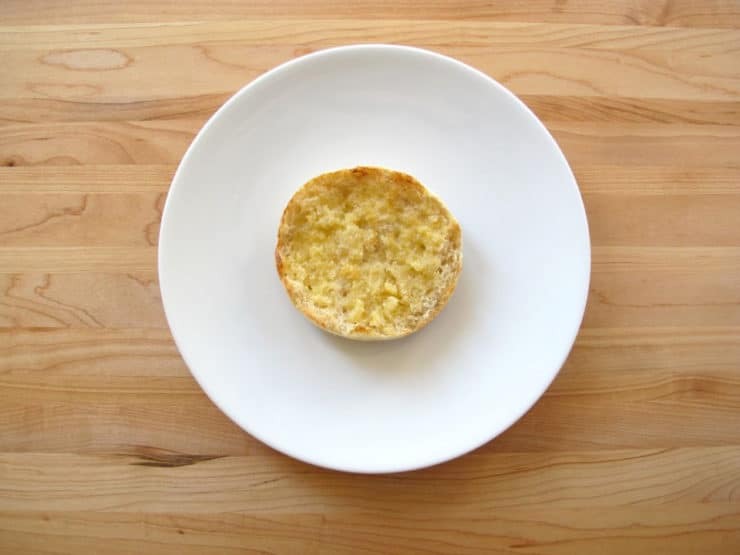 Toast your English muffins. Butter the four toasted halves and set them onto serving plates. 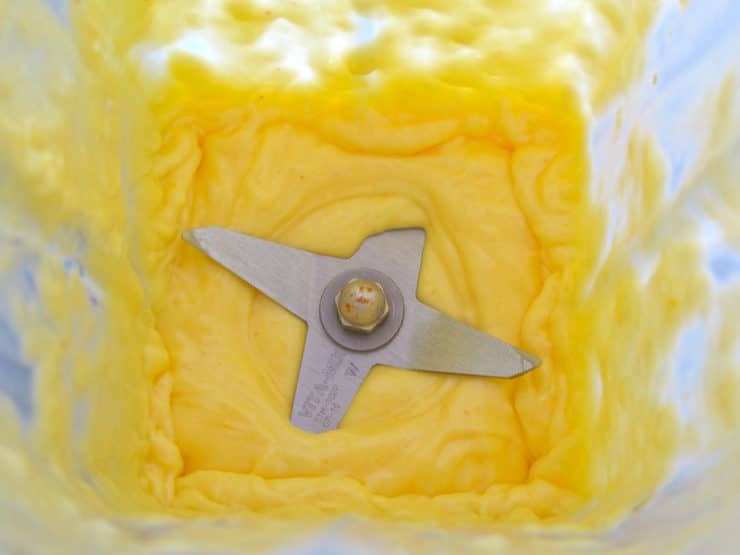 Make your hollandaise sauce just before serving-- it will only take about 3 minutes. Click here for recipe. Pour 2 tbsp of hollandaise onto each egg. Garnish each egg with a sprig of fresh dill. Serve. Note: Use caution in consuming raw and lightly cooked eggs due to the slight risk of salmonella or other food-borne illness. To reduce this risk, use only fresh, properly refrigerated, clean grade A or AA eggs with intact shells, and avoid contact between the yolks or whites and the shell. I have had very little luck with poaching eggs, as I don’t have easy access to farm fresh eggs. Is it acceptable to substitute an egg that is cooked “over easy”? 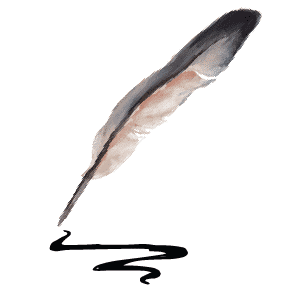 or is it a faux pas? Hi Dalia, Tori’s assistant Ashley here. Eggs Benedict is traditionally made with poached eggs, but if you have more luck with over easy or prefer them that way, that’s okay too! I don’t like Canadian bacon either, so I make my Eggs Benedict with prosciutto. Try it! It adds a little saltiness to the bottom of the poached egg and is far more tender than that Canadian bacon stuff. (It always makes me think I’m eating an Egg McMuffin.) I also love using lox. My poached eggs never came out correctly. Went to the link and read what I have been doing wrong. Thank you. Maybe now they won’t be such a mess. Love this have made this for many years. Mmm so good. Only one question regarding the poached eggs – when are eggs in season so I don’t have to poach them?! LOL!!! Also, it’s opening weekend in Los Angeles for Deli Man, a great documentary about the history of delicatessens in America And I am so fortunate to live in Houston, home of Kenny & Ziggy’s!!! I saw this film earlier this week, it was great! Tori Avey that looks so good. It is great for people who don’t eat pork and for those who don’t mix meat and dairy. I grew up loving a good Nova Scotia lox and bagel with cream cheese and this gives me a new way to enjoy lox. Thanks and Shabbat Shalom. favorite thing in the world !!!!!!!!!!! Be still my heart – Yum! I made this for breakfast, I’m anemic, so I replaced the dill with cooked spinach on top of the egg. It was to die for!!!!!!! 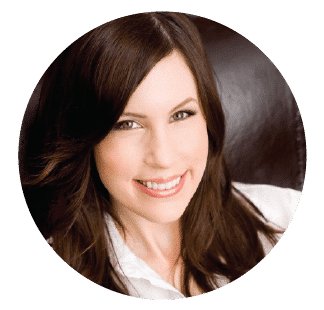 Hi Wendy– I suppose you could, but rather than incorporate it directly into the eggs benedict (which is really great as written) I would suggest serving a fresh spinach salad on the side… maybe one with fresh berries and a honey mustard dressing. Just a thought! You’ve got it wrong. Smoked salmon is not LOX. Lox is salt cured. Ernest, while it is true that in the past the term “lox” generally referred to salt brined salmon, the term “Nova lox” has always referred to salmon that is both salt cured and lightly cold smoked. Nowadays both salt cured and smoked salmon are popularly referred to as lox– the meaning of the word has changed throughout the decades. But Nova lox have always referred to smoked salmon. I have clarified the post to avoid any confusion. 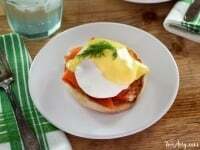 I LOVE Eggs Benedict with salmon/lox. Mmmm…. 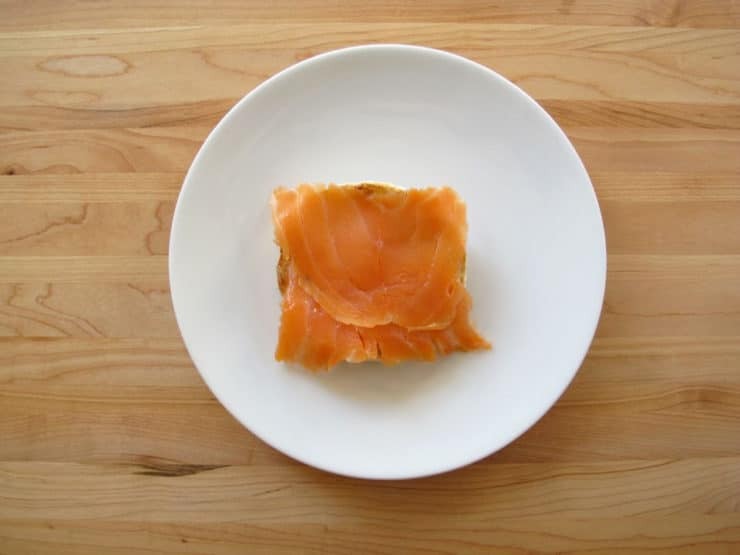 What can really up the taste level is instead of shmearing the English Muffin with butter, try shmearing with dab of cream cheese, then place a thinly sliced tomato and a few slices of paper thin red onions either below or on top of the lox. Then place the egg on top and pour the Hollandaise sauce on top of it all. The combination of all the flavors: cream cheese, tomatoes, lox, onions, eggs and Hollandaise sauce is truly divine. 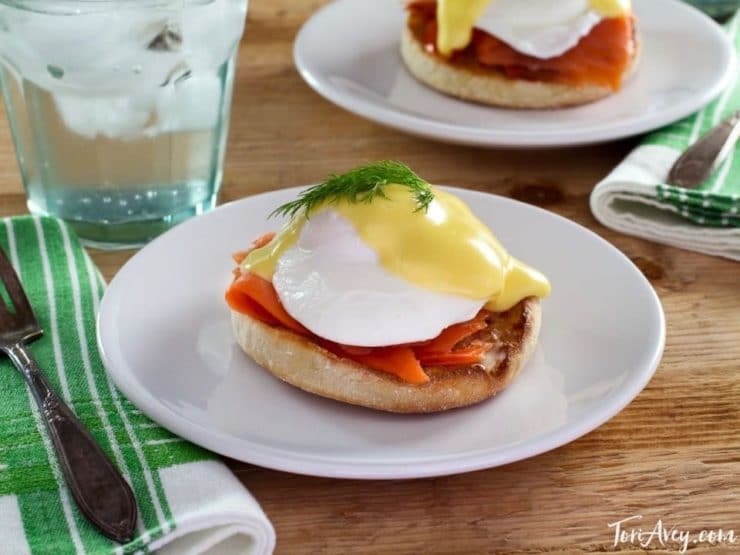 My wife Marsha is going to bed now but tomorrow I’m showing her your recipe and asking her to make those picture perfect eggs, Nova Lox Benedict. Can’t wait! Perfect! Was looking for something non-meat to make tonight and then your recipe tumbled out of my laptop! I made this for a ladies brunch, and it was a hit. I have to say, though, that your poaching method wasn’t as successful for me. I ended up using Julia Child’s method, and it’s marvelous. I had a combination of eggs Benedict / Florentine for the first time for Mother’s day ( had never had either one ) and that flavor is now my favorite , told my friends that was better than chocolate and nothing is better than chocolate. 😉 This looks wonderful with the salmon! Before I developed an allergy to salmon, that was one of my favorites! 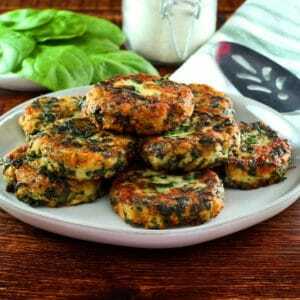 Now, I just have it without any meat – or spinach! Thanks for the recipe for Hollandaise, it’s on my culinary bucket list. Kosher Clarification — Eggs from kosher fowl are pareve (aka parve), which is neither meat nor dairy and can be mixed with either. Salmon is also pareve as it is a fish which is not considered meat (if it were, Jews keeping kosher would not be able to eat lox with cream cheese on their bagels). Poaching eggs in milk makes the result dairy, as does putting hollandaise sauce on it (contains butter) but nothing in this is considered meat. My boyfriend and I eat eggs for breakfast literally every day…there are only so many veggie/meat/egg combos you can come up with before you exhaust them all. 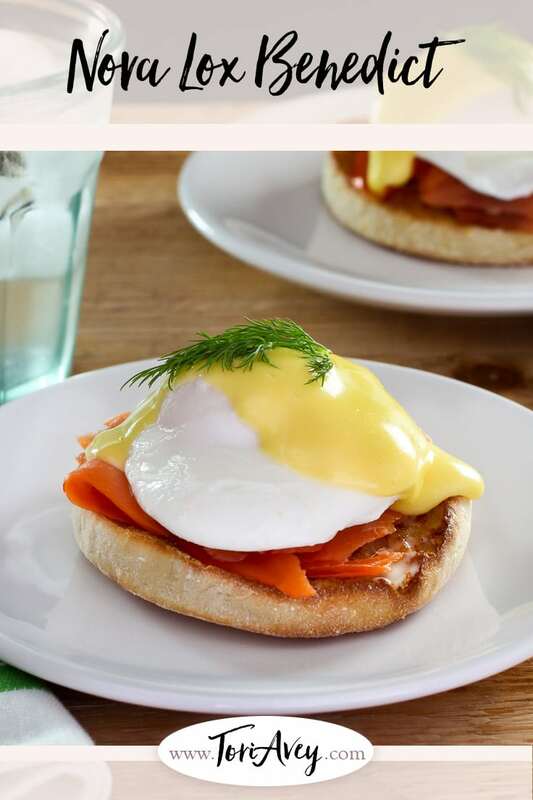 I can’t believe I have never made eggs benedict – probably because I never looked for a homemade hollandaise sauce recipe. I love the nova lox benedict idea. I’m definitely going to make this soon to change up the morning scramble routine. Have a fun weekend! Wonderful! So glad I found this. Eggs Benedict is one of my all time favorite foods and this method for preparing the hollandaise sauce is so much easier than the way I was taught. 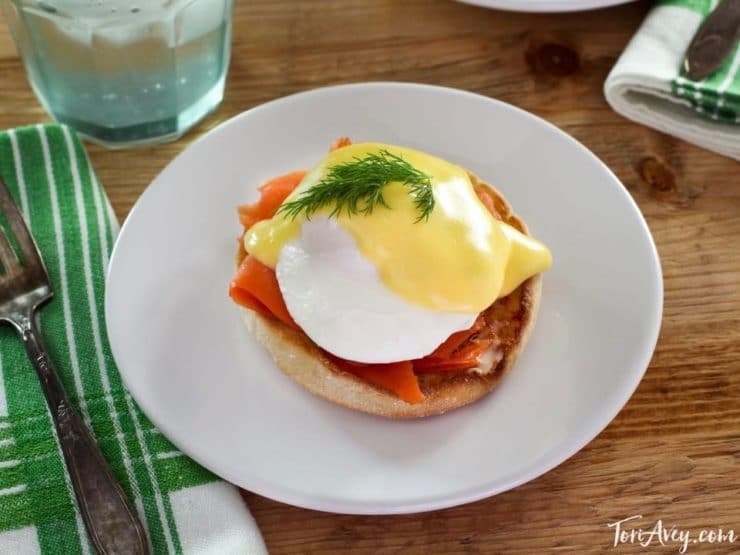 Just when I thought eggs benedict couldn’t get any better – you added lox! I love it! love the color and very nice presentation. Now… that is so tempting…..where is a good place to buy the salmon? Can any salmon be used. I live in the boring midwest…. Walmart carries Nova lox from Canada in small packages. I found it in one of their deli cases with pre-packaged sliced meats. My mouth is watering. Eggs Benedict is just about my favorite food. let’s see: Nova Lox, Eggs, English Muffins, BUTTER, Lemon…I’m dyin’ oveh heah!!! !